Charming Villa Erasmo (Pisciotta-Caprioli), an insiders’ tip in the heart of the Cilento National Park, is attractive due to its marvelous view and comfortable furnishing. As it accommodates up to ten persons and offers four terraces, the holiday home is perfect for couples who are friends or for a large family. 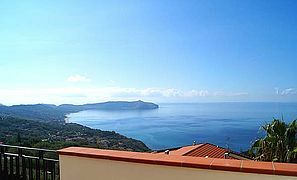 Viewed from the villa you meet with a panorama in a class of its own – encompassing the Cilento’s year-round green hilly landscape, Capo Palinuro and the deep blue of the Tyrrhenian Sea. 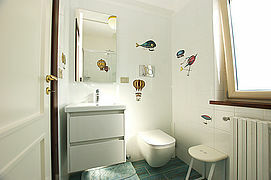 Bathing is possible not only in the holiday home’s pool, but also at the sandy beaches in the surrounding area. 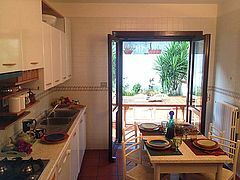 The beach of Capo D’Arena and restaurants are only about 4 kilometers off. Shopping facilities and grocery stores are only 1 kilometer off. 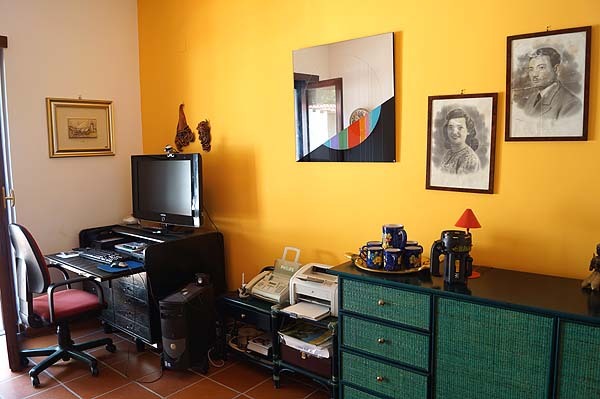 Ideal for those who want to spend a longer holiday: in the office with PC and internet access you are able to attend to your work for a few hours even during your holidays. 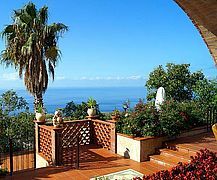 And then you can quickly switch off again by taking a refreshing plunge into the pool and by enjoying the far view of the sea. 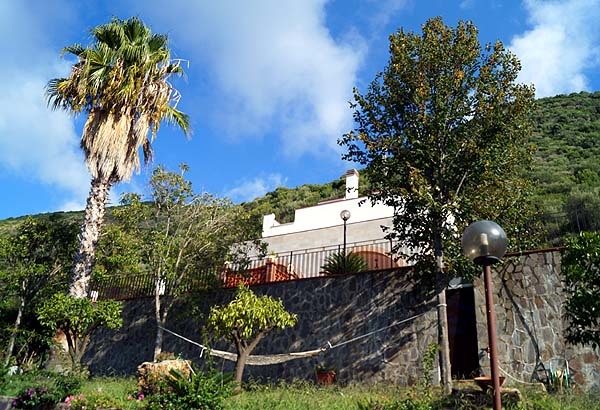 On the spacious premises, you find generously laid out terrace areas as well as a small lawn with hammock. The lower and at the same time largest terrace, where the pool (open from May 1st to October 31st, changes due to weather conditions possible) is located, offers a fantastic view of Capo Palinuro and a lot of space for sunbathing and relaxing on one of the numerous sunbeds. 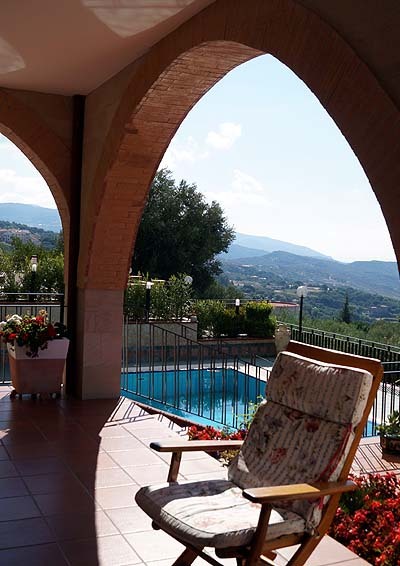 The roofed part, in front of the living room, is the shady area for relaxing on hot days. 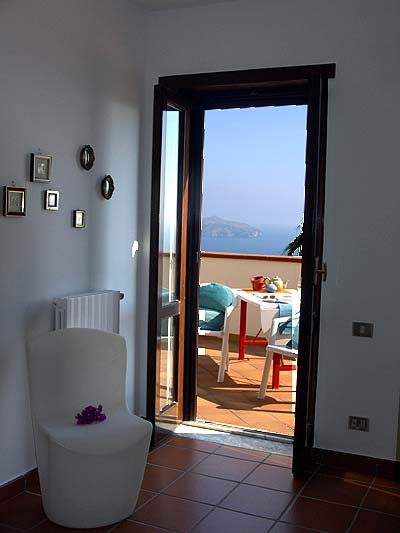 The sea view terrace of the 2nd floor is also furnished with sunbeds. 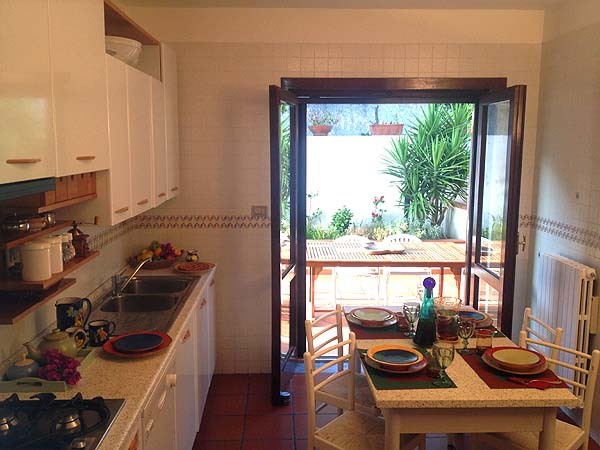 The rear terrace is accessible from the kitchen and the office of the villa. 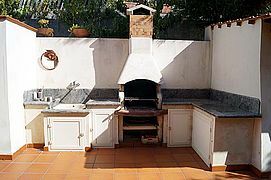 There is garden furniture as well as a pizza oven and a barbecue. The roof terrace with its fantastic far-reaching view is surely a highlight of the villa. 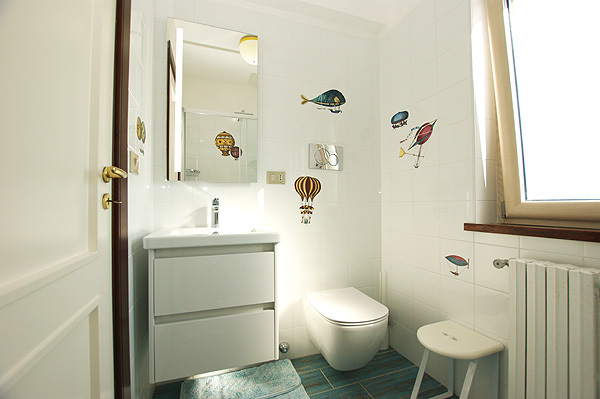 PC with internet access, air conditioning in the living quarters, central heating, fireside, SAT-TV, DVD player, radio, piano, pool, outdoor shower, pizza oven, barbecue, dish washer, washing machine. 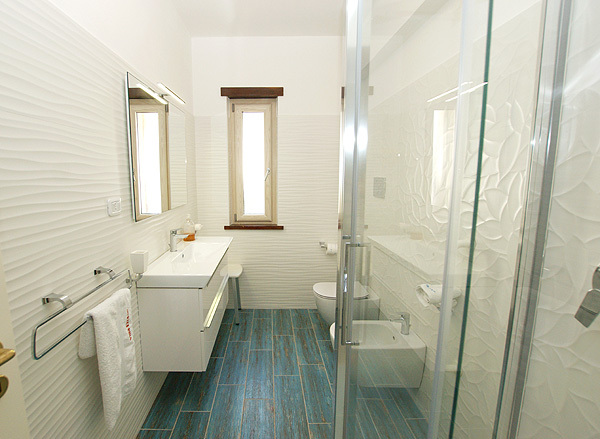 It is about 1 km to the center of Caprioli with shopping facilities. 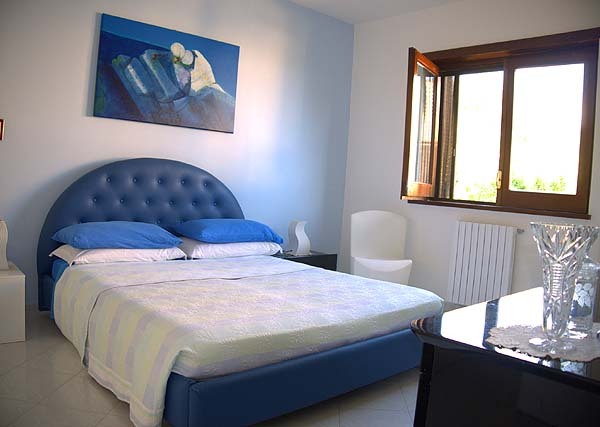 Restaurants, bars and the sandy beach of Capo d’Arena are ca. 4 km off. 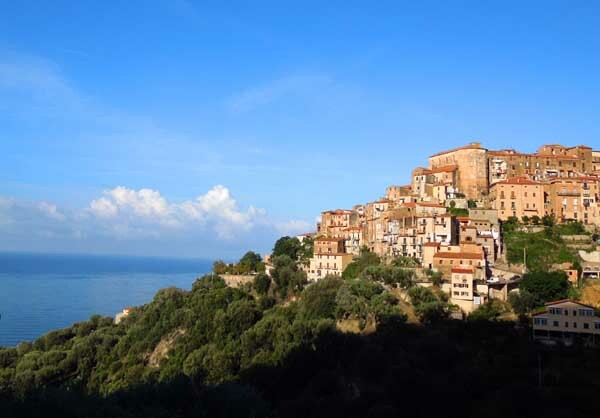 Take a trip into the past and visit the medieval mountain town of Pisciotta only 4 km off. Stroll through the narrow alleys of the town and then enjoy a creamy cappuccino in one of the bars in the piazza, where young and old meet for a chat. 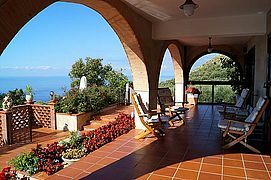 Villa Erasmo’s location is strategically perfect – close to the most beautiful places and sights of the UNESCO World Heritage Site ‘Cilento’. During a day trip you might, for example, visit the late Baroque Carthusian monastery "Certosa di San Lorenzo" at Padula, which counts among the most significant ecclesiastical monuments of Italy. 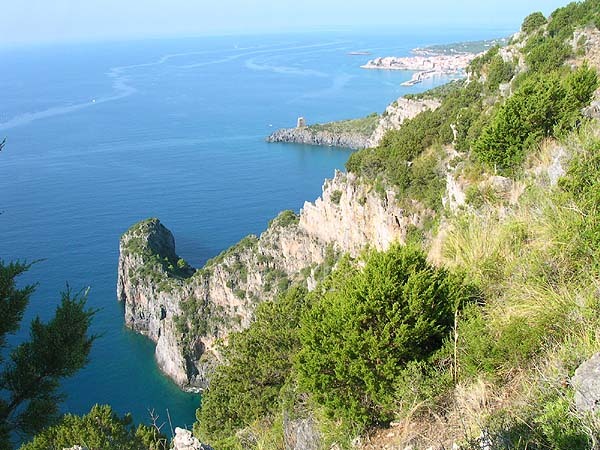 The maritime wildlife park of Infreschi, where you can hike along an untouched coast, bath in solitary bays and go on boat trips, is not far away either. Nearest train station: Pisciotta-Palinuro (ca. 2,5 km). 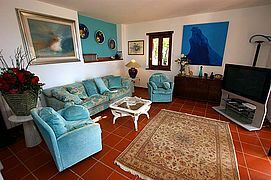 Enjoy fantastic holidays in the authentic Cilento at comfortable Villa Erasmo. 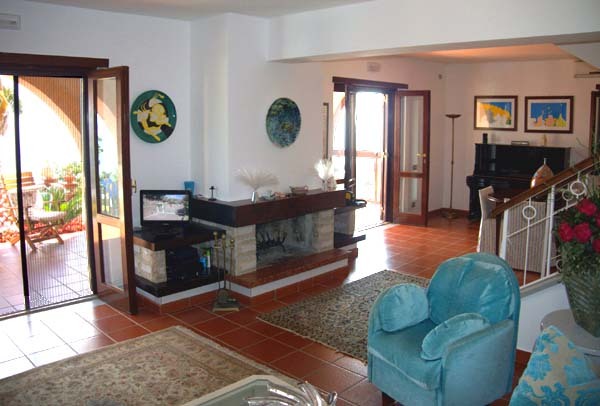 Stately living in the living-dining room with fireside, SAT-TV and access of the sea view terrace with pool. 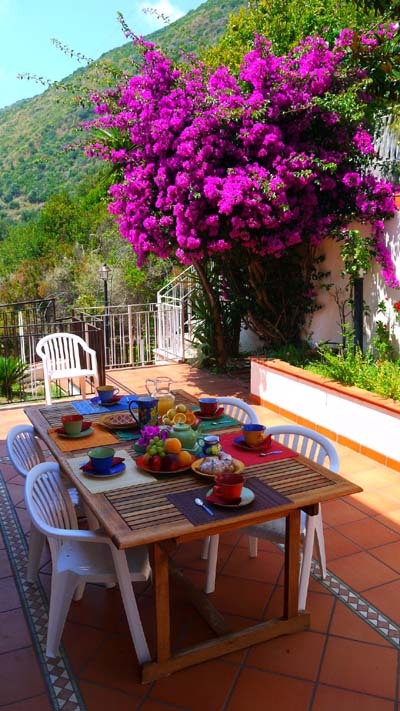 When your gaze drifts across the terrace, it meets with the colors of summer. 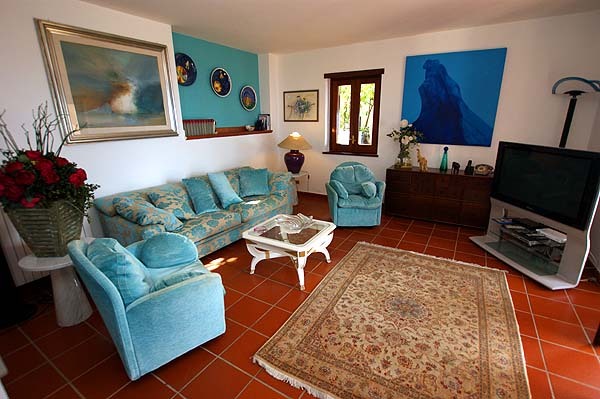 On the terraced premises, each guest finds enough space for relaxing. The sea within reach… (here: view from the roof terrace). 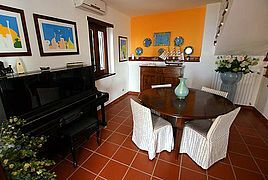 Tastefully furnished dining area with piano. On the front terrace, the roofed area offers shade on hot days. 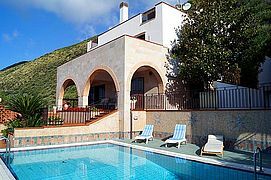 The great location of the villa surrounded by the green of nature. 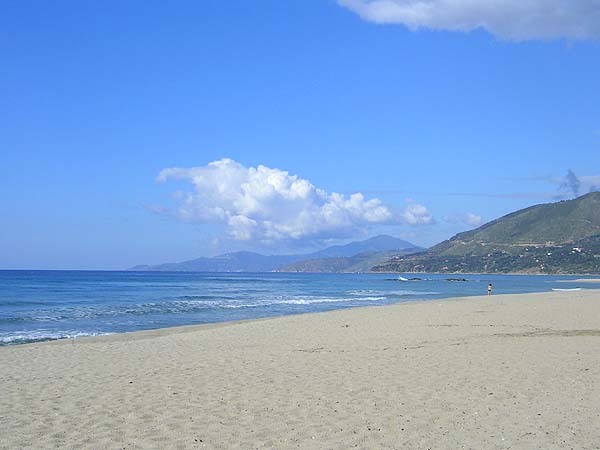 Nearest sandy beach: Capo d'Arena. 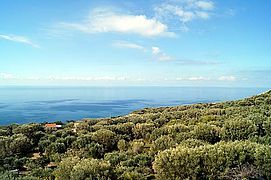 The picturesque town of Pisciotta lies enthroned on a hill top. 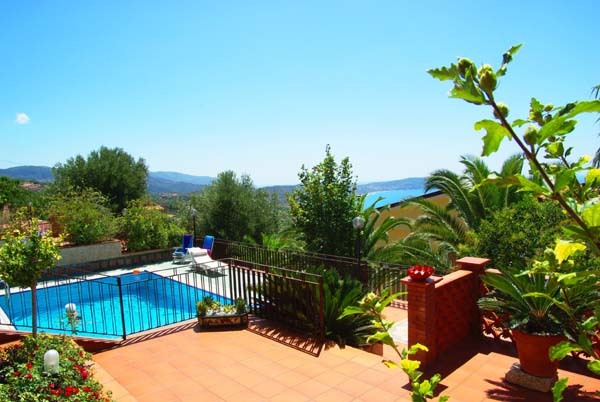 Exterior shot of the spacious property. 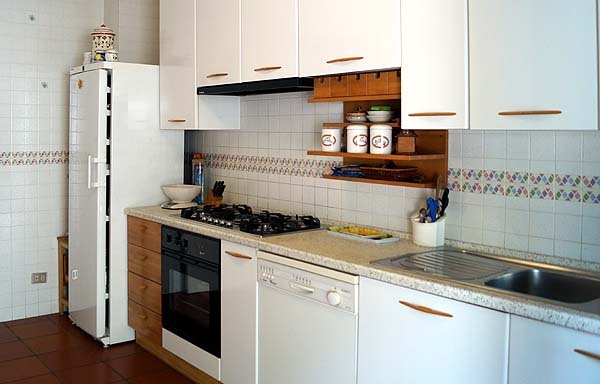 Ideal for culinary delights on mild summer evenings – outdoor barbecue and pizza oven. 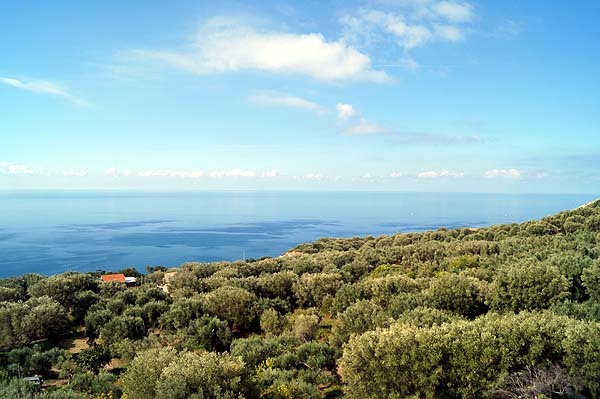 Marvelous view of the sea across olive groves – from Villa Erasmo. 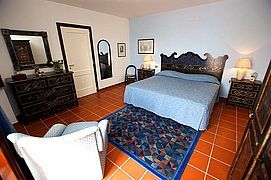 One of four double rooms at Villa Erasmo. ... the rear terrace with barbecue and pizza oven. From the living-dining room you access the partly roofed terrace and the swimming pool. 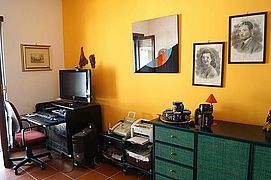 The office of the villa with PC and internet access. Nearby maritime wildlife park Baia Infreschi. 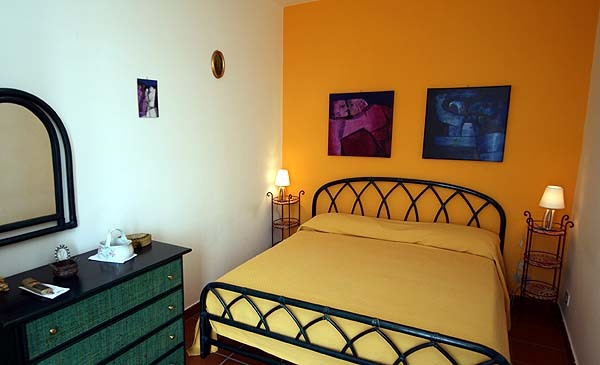 Another double bedroom of the villa. In 2 of the 4 rooms: access of the sea view terrace. ...with large shower cabin, WC and bidet. On the second floor: another bathroom with a large shower cabin, too. Die Villa Erasmo liegt gut, nämlich einerseits ruhig und ein wenig abgelegen, aber doch so zentral im Cilento, dass man viel unternehmen kann. Das Haus ist großzügig gestaltet und gut ausgestattet. 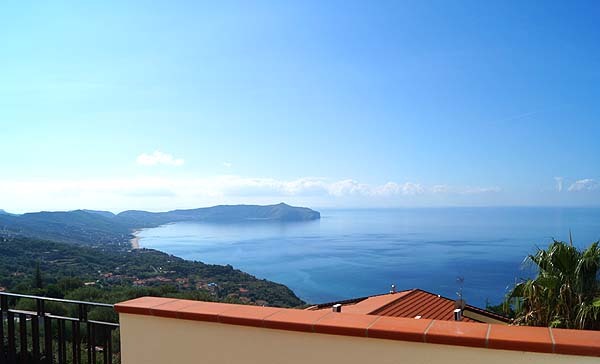 Unser Highlight war das 'Cilento-Show-Cooking' des Gastgebers. Die Region selbst hat uns mit der tollen Natur und den Stränden beeindruckt. Die Menschen sind hier genauso ehrlich wie der Wein und es gibt angenehm wenig Touristen. Sehr erholsam und daher gerne wieder. * During travel seasons 06.10. 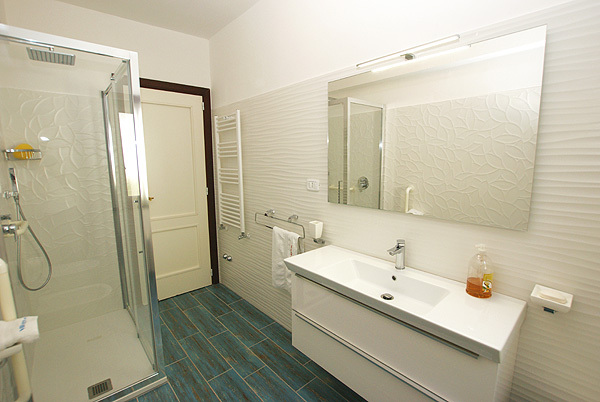 - 03.11.18, 30.03.19 - 27.04.19 and 05.10.19 - 02.11.19 the 5th - 10th persons are charged an extra € 100 per week each. During travel seasons 01.09. - 06.10.18, 25.05. - 29.06.19 and 31.08. - 05.10.19 the 7th - 10th persons are charged an extra € 150 per week each. Costs for heating and air conditioning are charged on the spot according to use. 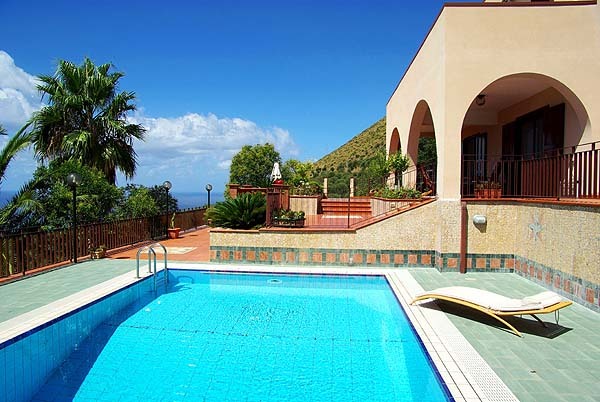 A deposit of € 200 is due upon arrival.